Thanks to advancements in WordPress, creating an online shop has basically become piece of cake. If you’re looking to put together a marketplace though, where sellers and buyers come together, things get a bit tricky. We’re not going to lie – launching and managing a marketplace website is a time-consuming and complex process. You need to ensure smooth user registration and provide safe payment options. Luckily, choosing one of the best marketplace WordPress themes from our list can significantly ease your workload. And we have a few premium choices just for you. Read on. 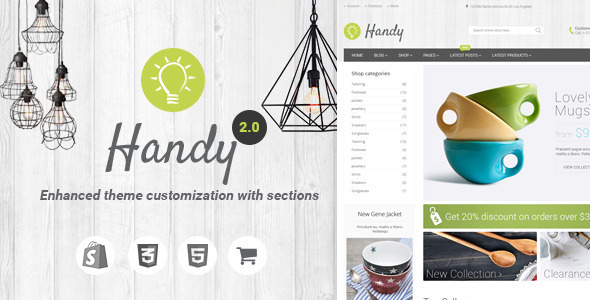 Handy offers a great start for anyone looking to create a handmade online shop or marketplace. The theme comes with a suite of practical features, like the out of the box layout configurator. This allows you to set custom layouts, megamenu, video slideshows etc. It’s insanely easy to tweak, has enhanced search features, and looks beautiful on a variety of devices – from smartphones to tablets and PCs. MarketHub was designed to offer maximum flexibility and scalability. The main functionality of the theme is built based on the WooCommerce and WC Vendors plugins. You will be able to create your own digital marketplace with just a few clicks. MarketHub provides several helpful page templates that will come in handy and is pretty lightweight, with no unnecessary libraries. Plus, it offers advanced reviews and testimonials support. Running your online marketplace will be a breeze. 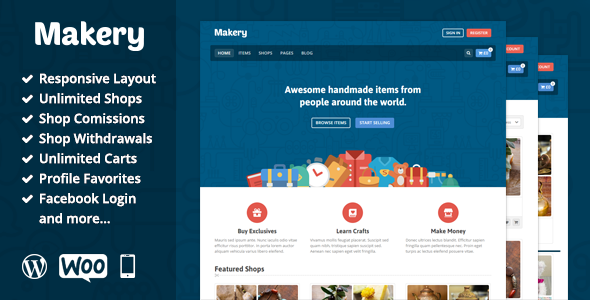 Our list of the best marketplace WordPress themes wouldn’t be complete without Makery. 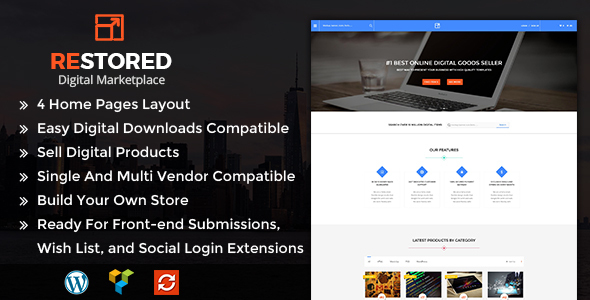 Slick and powerful, the theme comes with awesome built-in features, such as unlimited shops, multiple carts, shop commissions and more. It’s easy to customize, so you can fully change fonts, colors, backgrounds, slider settings, switch between page layouts, create sidebars, edit email notifications etc. All in all, Makery is a great choice for anyone looking to build their very own marketing website. Promoted as a complete marketplace theme for digital downloads, Restored MarketPlace lives up to the hype. The theme is built on Easy Digital Downloads Plugin. It enables you to easily build the online store of your dreams without breaking the bank. You can sell anything digital – stock photos, plugins, software, audio file, videos, music, digital art, themes, and so on. The theme is easy to install and manage and comes with four home page layouts. It includes the Slider Revolution and Visual Composer plugins and it’s ready for frontend submissions, wish lists, social media login, etc. 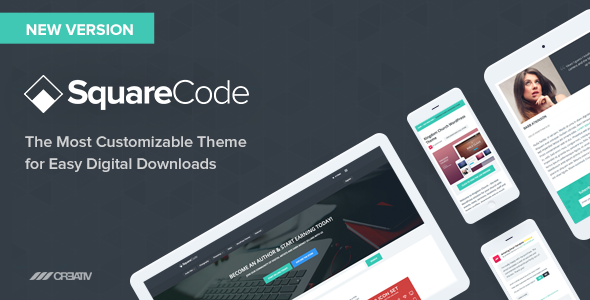 One of the best marketplace WordPress themes available, for sure. Marketify provides you with all the resources you need to build your very own digital marketplace. It comes with tons of pre-designed page templates, frontend submission, and recommended products. It also packs other cool features you will surely appreciate. Plus, the theme comes with extensive documentation that will get your site up and running quickly and seamlessly. Its aim is to easily allow authors to create accounts and list their products. Then, buyers can purchase products and immediately have access to downloads. All in all, all you need to worry about is attracting the right kind of crowd. Note: To take full advantage of Marketify you must also download Easy Digital Downloads (which is free). You may also want to purchase a couple of their add-ons (prices vary) to add more features to your marketplace. 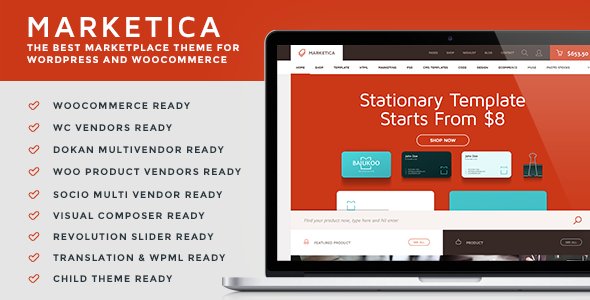 Rounding up our list of the best marketplace WordPress themes, Marketica comes with five demos and several video tutorials. That’s a great perk for those who are just starting to grasp WordPress and its many features. Every vendor will have a dedicated vendor page on your site where they will be able to list all of their products. Furthermore, you can sell your own products alongside those of your vendors. The Visual Composer and Revolution Slider plugins are included. Beautifully designed and packed with ton of features, Checkout grabs your attention thanks to its flexibility and ease of use. The theme comes with a slick dashboard for your vendors and a user-friendly getting started dashboard. It also packs a sleek portfolio feature. With Checkout and Easy Digital Downloads you can create your own digital goods store to sell stock photography, audio files, eBooks, videos, and more. Plus, to turn you store into a multi-vendor marketplace you just need to use the EDD Marketplace Bundle. Vendors will be able to submit products for sale on your website. All you need to do is enable the Commissions extension to earn a cut of every sale made on your website! Note: The EDD Marketplace Bundle is sold separately ($199). This elegant, bloat-free theme uses the power of the very popular Easy Digital Downloads plugin to enable you to sell anything digital. Moreover, you can expand to include Front End Submissions (multiple authors selling products, like ThemeForest), reviews, or physical goods using other low cost paid plugin options. SquareCode comes with a polished design, EDD Wish Lists Support, and powerful theme options. The theme is very versatile. You can use it to sell digital goods, physical products, showcase career listings, build a portfolio, and so on. If you’re dreaming of creating a professional job board, now is your chance to make your dream come true. 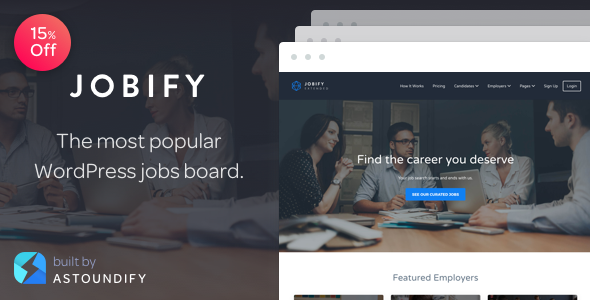 Jobify is a complete solution for those looking to connect employers to potential candidates. A marketplace for jobs, if you wish. The theme offers a plethora of advanced features that will allow you to get your site up and running in minutes. No programming knowledge required. It comes with a drag and drop page builder, powerful plugin integration, enhanced search features, and location filtering. Pretty cool, right? 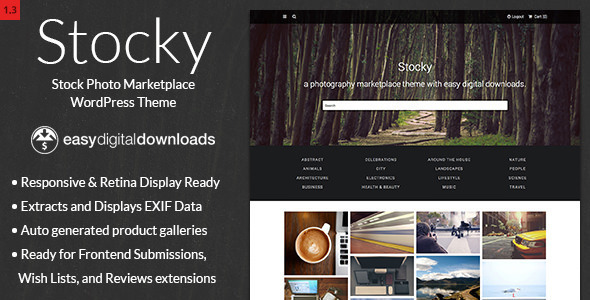 As the name suggests, Stocky is mainly a photography marketplace theme. Built on WordPress and Easy Digital Downloads, it allows you to sell your pics. Moreover, you can also allow anybody to upload their photos and sell through your site via the available extensions in the Marketplace Bundle. Stocky comes with dedicated pages (vendor portfolio, login/register), auto-generated product galleries, and great support. Plus, it extracts and displays EXIF data and is ready for frontend submissions, wish lists, and reviews extensions. Not too shabby. 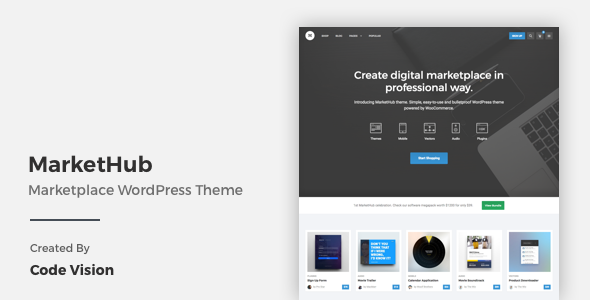 Why Choose One of the Best Marketplace WordPress Themes on Our List? Building a marketplace website from scratch can be a daunting task. A great idea isn’t enough anymore – you also need the resources to implement it with style. Choosing the right WordPress theme is the first step to jumpstart your project. Not to mention that it can make the difference between a smooth launch and constant complaints from users. Packed with awesome functionality and impressive design, the best marketplace WordPress themes on our list were developed with the user in mind. Their effective features will guarantee your website runs smoothly and keep vendors/buyers content. You can focus on what’s really important: growing your business, improving your services, and promoting your site to a wider audience. What do sites like Etsy, Upwork, Fiverr, and Amazon have in common? They’re not only extremely useful to the public – they also look great and work flawlessly. Choosing one of the best marketplace WordPress themes from our list gives you the head start you need to bring multiple third party sellers and buyers together to your little corner of the Internet. As long as things run swimmingly, there’s nothing left to do but grow. As always, for more WordPress tips and tricks keep browsing our site or subscribe to our newsletter.